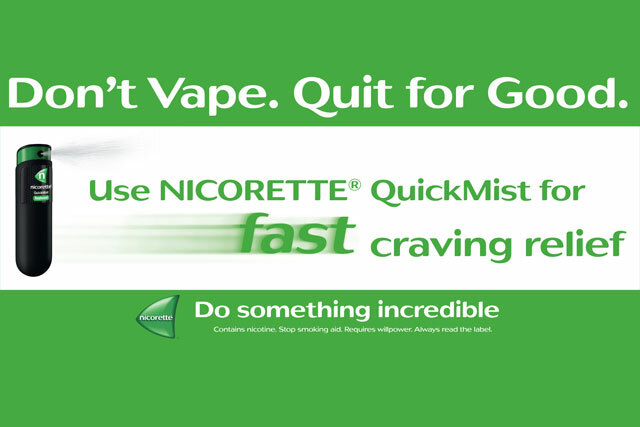 E-cigarette brands have attacked an ad campaign by Nicorette that tells smokers not to "vape". The outdoor campaign, promoting the Johnson & Johnson smoking cessation aid’s QuickMist product, carries the headline: "Don’t Vape. Quit for Good". Charles Hamshaw-Thomas, legal and corporate affairs director, E-Lites slammed the activity, saying it showed that Nicorette was "rattled" by the increasing popularity of e-cigarettes. Hamshaw-Thomas said: "This advert is a disingenuous attempt by the pharmaceutical industry to smear e-cigarettes. Scientists and the UK’s 2.1 million regular e-cig users know that e-cigarettes are smokers' preferred option in reducing or stopping their tobacco dependency." Blu eCigs marketing director James Dodkin said e-cigarettes had a "vital" role to play in offering an alternative to traditional tobacco products. He said: "Although Blu eCigs are not marketed as quitting aids, they represent a positive lifestyle change, and this should be encouraged." According to Mintel, 2013 UK value sales of e-cigarettes are an estimated £193m, an increase of 340% on the previous year. In contrast, the smoking cessation market, which features brands such as Nicotinell, NiQuitin and Nicorette, has seen annual growth of up to 10% over the last decade. But this has slowed since 2012 to just 1.7% for 2013, a trend Mintel attributes to the advent of e-cigarettes. A spokeswoman for Nicorette defended the campaign, saying it was "important" to note that there were no electronic cigarette products currently licensed as a medicinal stop-smoking aid in the UK. She said: "The Nicorette advertisement, which includes the line 'Don’t Vape, Quit for Good' is aimed at cigarette smokers who want to quit, and who are weighing up the different product options to support them in a quit attempt." Has e-cigarette brand Blu's new digital plan gone up in smoke?